Sure, your parents may have taught you that eavesdropping is rude. But you know it's hard to stop listening when something dramatic is unfolding near you in a restaurant or on the train. 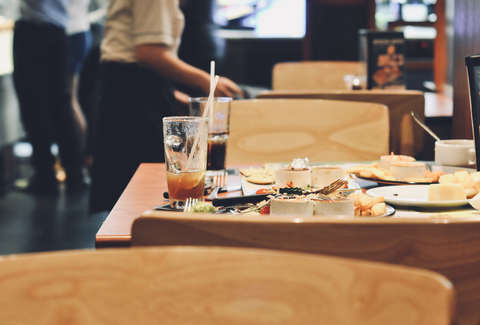 Sometimes the pay off is too great, like this story recently shared by comedian Stuart Laws, who witnessed a battle over dirty dishes unfold in a British coffee shop. The story is beautifully suited to unfolding via Twitter in real time. It took multiple unexpected twists and turns as Laws relayed the play-by-play in a cafe. From the battle's opening salvo, Laws could tell this was going to head somewhere interesting. Yes, she dropped dirty dishes on someone else's table and then acted like everything was totally normal. You know this can't end well. "Well, I didn't want them on my table and you just put them there without asking"
"Well put them on another table if you don't want them on yours"
"No, I'm putting them here"
Dirty plates woman started moving dirty plates back to the clean woman's table, whilst clean woman was finishing moving dirty plates from whence they came. Neither are talking now, or looking at each other. Unbelievable scenes. DPW: "I'm just trying to have a quiet tea, I don't need all this bother please"
"I met this woman about 20 minutes ago when she moved all of the dirty plates off of her table and onto mine, without asking"
Nothing much happening in the book group at the moment beyond book analysis, rest of cafe pretty empty. I realised that if you count me and the staff member that makes 9 perfect strangers but HoBG knows Patrick and there's another staff member so it doesn't work. Official Book Group is over but it's now unofficial socialising time, two people made a quick getaway, the rest are just chatting. CPW looks lost, desperately trying to think of a way to get revenge? DPW says she has to leave, Patrick laughs and I'm not sure why, shakes her hand. DPW does a Patrice Evra style ignoring of CPW, goes and pays her bill, talks to Staff Member for a bit, laughs about something and then leaves. That's a bold, bold move to close out this protracted battle over someone else's dirty dishes. This doesn't mean your parents were wrong if they told you not to eavesdrop, but even they would have ordered another coffee to watch this through to the end.